Jeff Weiss is the Chief Revenue Officer of CMiC. As the leader of the outside and inside sales, solutions consulting, marketing and channel management organizations, Mr. Weiss is responsible for driving revenue growth on a worldwide basis. With over 27 years of experience in the B2B software industry, he has led CMiC’s successful partnerships with hundreds of North America’s leading construction firms. Leveraging CMiC’s deep capabilities and expertise in enterprise financial and project management, Mr. Weiss is expanding CMiC into project-based industries beyond construction. He joined CMiC in 1991 as a senior systems consultant and was promoted to Director of International Business in 1993 and to Vice President in 1995. Mr. Weiss holds an MS in Engineering and an MBA. He can be reached at www.cmicglobal.com. This fall, the United States was hit with a series of tropical storms that caused extreme destruction and mass evacuations. It’s estimated that together, Hurricane Harvey and Hurricane Irma caused $290 billion in damages. Harvey accounts for the majority of this figure: the rebuild is expected to cost $190 billion, making Harvey one of the costliest weather disasters in U.S. history. In the wake of these disasters, a new reality has been made apparent: We’re entering an age of increased risk from extreme weather events. For an industry as susceptible to weather as construction, this is not good news. By its nature, construction is dependent on weather. Project planning and design are determined in large part by the landscape, geography, and local weather. Building strategies and materials are tailored to suit a particular climate. And of course, construction teams work outside. In addition to the effects felt by citizens and residents, extreme weather events can derail projects, endanger workers, and increase construction costs considerably. Because weather is becoming more extreme and less predictable, it’s important for construction firms to develop strategies of resilience. But first, we have to know what we’re up against. 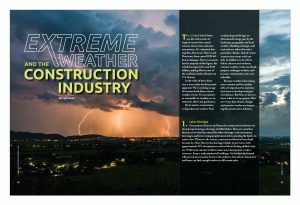 Here are 4 ways that climate change and extreme weather are impacting the construction industry. Even prior to Harvey and Irma, the construction industry was already experiencing a shortage of skilled labor. There are countless theories as to what has caused the labor shortage: early retirement, low wages, and fewer young people interested in entering the field—to name a few. Whatever the reason, construction labor has been hard to come by. After Harvey, the shortage is likely to get worse, with approximately 91% of contractors worried about finding skilled workers. With more extreme weather comes more destruction to infrastructure, homes, and commercial buildings. An increase in demand will provide an economic boost to the industry, but only if contractors and firms can find enough workers to fill vacant roles. 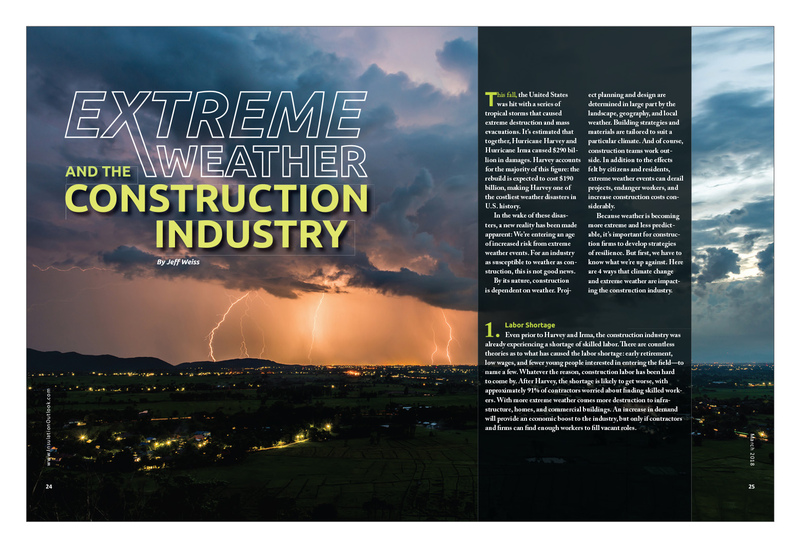 Many construction firms have grown accustomed to the weather patterns and climate within the areas they do business. Through experience and data gathering, they’ve developed strategies for ensuring that inclement weather doesn’t threaten a project’s success. Unfortunately, climate change has caused weather to become much less predictable. Across the globe, regions are seeing unusual weather patterns that are atypical. In 2009, for example, London, England, experienced the worst snowfall in almost 20 years. The city was ill-equipped to deal with the snow and it’s estimated that this disruption cost them billions in snow removal, lost revenues, and emergency services. When construction firms become unable to predict weather patterns and develop emergency plans for weather variables, it puts their entire business at risk. Unusual weather conditions can also throw a wrench into a firm’s procedures for caring for equipment and preventing weather damage. Weather can affect the performance and wear and tear of construction equipment. Dry weather can increase the amount of dust on the job site, which can jam and clog machinery. Strong winds can strain equipment and cause breakage. And hot weather can reduce the efficacy of materials like sealants and mortar. Most firms have protocols in place for preventing weather damage, but those procedures are location and climate dependent. As weather patterns shift, firms may not be familiar with the procedures for caring for equipment in more extreme conditions. Extreme weather makes construction materials harder to source and purchase. Drought, flooding and storms can cause scarcity, which may drive up cost or prevent materials from be obtained at all. For example, flooding in areas where natural resources are being extracted can cause a shortage in the raw ingredients used to make construction materials. In contrast, drought can prevent construction sites from getting enough water to complete vital tasks. A phenomenon like erosion can create shortages of materials like sand, which is used to make concrete and asphalt and is becoming hard to source. The good news: material scarcity creates an opportunity for developing innovative ways to meet the materials needs of construction projects. Recycled materials and the circular economy are 2 ways of lowering the impact of construction material extraction on the planet and reducing industry dependence on depleted resources. These are just some of the ways that climate change can threaten the success and security of the construction industry, but there are more. In light of these threats, it’s important for firms to develop strategies for handling extreme weather. One of the best ways to build resilience is to improve the efficiency of your firm’s planning and communication procedures. That way, when extreme weather events arise, you’re organized enough to deal with the emergency effectively. This can be done by using construction software to run a tight ship—a ship that’s better able to weather storms both literal and figurative. Construction software will create company-wide transparency with regards to financials, scheduling, and project planning, ensuring that everyone has the information they need to rearrange work, adjust budgets, and ensure employee safety.